IT JUST keeps on banging. A dying star was caught mid-explosion in September 2014 and still isn’t done. It has lasted 10 times longer than any other supernova of its type that we’ve seen. Most supernovae brighten once as they explode and then fade into obscurity. But supernova iPTF14hls has had at least five peaks in brightness since Iair Arcavi at the University of California, Santa Barbara, and his colleagues began watching it (Nature, DOI: 10.1038/nature24030). It finally seems to be fading, he says. “It refused to go gentle into that good night. It just kept on exploding and exploding,” says Stan Woosley at the University of California, Santa Cruz. Evidence of one of the star’s past explosions comes through in its light, which reveals a shell of material around the star. The light from iPTF14hls has a signature identical to common type II-P supernovae, in which a massive star’s core collapses and becomes a neutron star, with the resulting shock wave blowing away its hydrogen-rich outer layers. Their bright flash lasts about 100 days before fading. This supernova seems to be acting a little like a type II-P in slow motion. After 600 days of exploding, it looks like a type II-P supernova after 60 days. It is also radiating several times more energy than any type II-P supernova we’ve ever seen. Arcavi and his team are trying to find a mathematical model that fits the star’s behaviour, but none has matched up yet. Woosley and Arcavi agree the most promising model is pulsational pair instability. The centres of very large stars – about 95 to 130 times the size of the sun – can reach over a billion degrees Celsius. At these temperatures, gamma rays in the core make pairs of electrons and their antimatter counterparts, positrons. The radiation pressure from gamma rays stops a star from collapsing under gravity. When the rays turn into particles, the star begins to fall in on itself, igniting an explosion that can blow off the star’s outer layer but leave the rest intact to begin the process over again. This could account for iPTF14hls’s many explosions and for a possible pre-supernova eruption observed in the same spot in 1954. It would also result in multiple shells of expanding material like the one we’ve already seen. But it’s not an exact match. Pulsational pair instability supernovae don’t produce the amount of energy or the mix of elements observed in iPTF14hls. Because the star has exploded several times, it may not even fit the definition of a supernova. “You think of a supernova as a death of a star, and you think of death as something that only happens once. 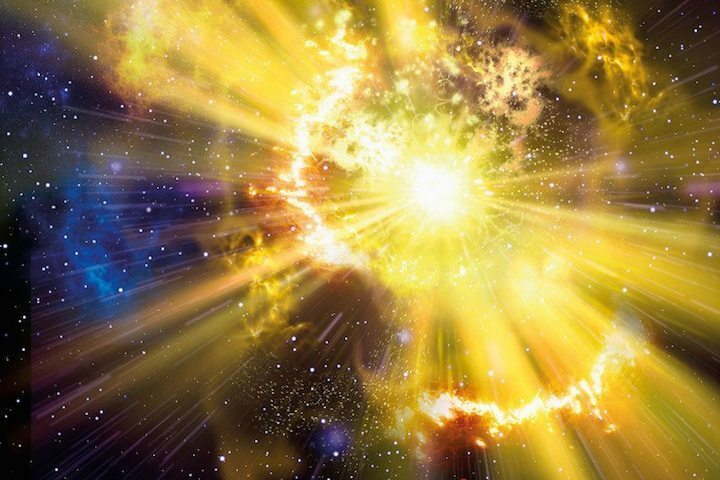 It’s a very different kind of supernova that can die repeatedly,” says Woosley.